Arsenal have completed a deal for Ivory Coast international defender Emmanuel Eboue, who has joined from Belgian club Beveren for a reported £1.5m fee. The 21-year-old agreed the move in November, and has now signed a five-year contract at Highbury. "He's a multi-functional player. He normally plays centre-back, but he can play right-back or midfield," Gunners boss Arsene Wenger said last year. 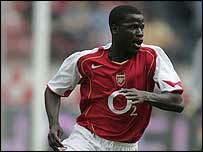 Eboue had been with Beveren, who act as a feeder club for Arsenal, since 2002. "In the summer he took part in some of Arsenal's preparatory matches and made quite an impression on Wenger," said a statement on Beveren's website. "Arsenal had already tried to buy Hatem Trabelsi from Ajax, but the transfer had never been completed, so they decided to buy Eboue," it added. In moving to Highbury Eboue will join compatriot Kolo Toure.